Perhaps more than any other poet Milton has suffered from mis-applied biographical interest and misapplied interest in his ideas. A great deal of the distaste for Milton’s poetry in the last seventy-five years has sprung from a dislike of Milton the man — as I heard Professor Douglas Bush ruefully remark a few years ago. 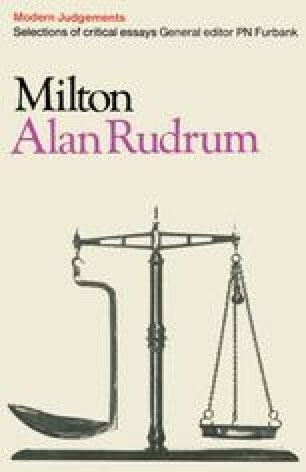 And though Milton’s ideas are important — Paradise Lost is not just a superb organ music throbbing in an intellectual void — still, our concern for this theological and philosophical consistency can push us into ruinous distortions of his poetry.